사라지는 순위 경쟁, 객관식 시험평가 폐지, 체험중심의 교과활동 등 대한민국 초등교육의 패러다임이 변하고 있습니다. 이에 발맞춰 초등 학습지 시장 또한 당장의 성적과 등수를 올려주는 시험 대비 시장에서 중/고등 학습의 기초체력이 되는 ‘공부력’을 키워줄 수 있는 기초 학습 시장으로 변화해가고 있습니다. 경쟁이 심화되는 시장에서 ‘공부력’을 핵심 가치로 한 미래엔 초등교육 프로그램은 소비자들의 긍정적인 초기 경험을 기반으로 하여 좀 더 대중적인 경험 확산까지 이끌어내기 위해 브랜드 인지도를 강화할 수 있는 캠페인이 필요했습니다. 많은 경쟁사 브랜드들은 브랜드명에 대한 인지도를 높이기 위해 CM송, 언어 유희 등 다양한 방법을 활용합니다. 그러나 자녀의 교육과 직접적으로 연관된 학습지 시장은 단순 브랜드 이름에 대한 인지만으로 움직이지 않습니다. 이러한 고관여 소비자들에게 미래엔 초등교육프로그램의 차별화된 강점을 전달하기 위해 브랜드명 뿐만 아니라 ‘공부력’이라는 솔루션까지 통합적으로 각인될 수 있는 캠페인을 런칭하게 되었습니다. 미래엔 초등교육프로그램을 대표할 수 있는 ‘하루한장’과 ‘탐깨비(탐구력을 깨우는 비주얼 씽킹)’는 브랜드명 자체가 학습의 솔루션입니다. 우리는 이러한 이름의 특징을 적극 활용하여 아이의 자신감을 키워주겠다는 추상적 메시지가 아닌, ‘하루한장으로 꾸준하게 공부하는 습관’, ‘어려운 텍스트가 아닌 비주얼로 쉽게 이해되는 공부법’이라는 구체적인 방법론을 제시하였습니다. ‘하루한장, ‘탐깨비’ 제품명의 반복되는 연호를 통해 임팩트 있게 브랜드를 인지시켰으며, 제품의 특성과 연결된 초등학생들의 다양한 학습 상황을 보여줌으로써 자연스럽게 제품의 특장점을 전달하였습니다. Disappearing competition surrounding grades, abolition of multiple choices, experience-oriented education. These are only a few examples of how the elementary education in South Korea is changing. As such, the Korean market of home-school materials is changing accordingly, from test and grade focused to basic ‘studying capability’ focused. In the market where competition around studying capability is becoming severe, MiraeN needed to rasie the band awareness in order to drive more brand experiences throughout the public. Many of competitor brands utilize various ways such as CM songs and puns to raise the awareness of the brand names. However, considering the market characteristics that it is directly related to the education of children, the influence of the brand name only is not enough. Therefore, we launched a campaign not only to raise the awareness of the brand name but also establish a strong recognition of the brand’s solution, ‘studying capability’, in order to differentiate the brand. Considering that the name of the products themselves indicate the solution, (‘Haruhanjang’ means ‘one page a day’ & ‘Tamkkaebi’ means ‘visual thinking to awaken the inquiry skills’.) we delivered a specific how-to based on the names with the key messages, ‘study consistently, one page at a time’ and ‘an easy-to-understand studying with visual aids’. 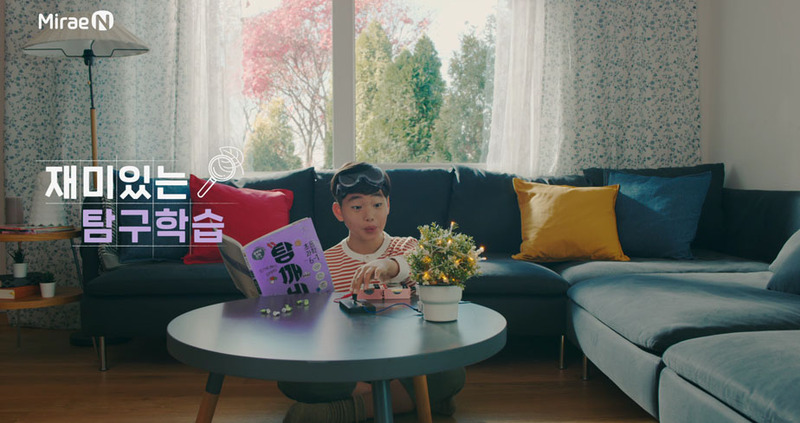 In addition, we repeated the product names in the campaign film while featuring diverse studying occasions of elementary school students linked to utilizing the products in order to naturally deliver the product characteristics.